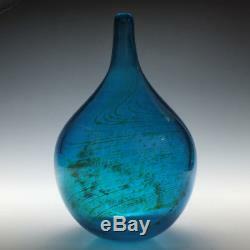 Mdina Maltese Blue Glass Vase c1975. Heading : Mdina glass vase Date : c1975 Period : 20. Century Origin : Mdina glass Malta. With mottled ochre and green swirling colourway. Pontil : Polished, signed Mdina Glass Type : Lead Size : 25.2cm tall and approximately 16.5cm diameter Condition : Excellent, no chips or cracks Restoration : None Weight : 1503 grams. References : Examples in the same colour can be seen in. Michael Harris Mdina Glass & Studio Glass by. We will also provide VAT discounts for all buyers outside the EU. Scottish Antiques is a third generation family business, a team of professional antiquarians with five full time members of staff. We supply a wide range of unusual and rare 18th and 19th century glass and porcelain to collectors around the world. Balusters and Balustroids to Air Twists and Opaque Twist glasses, Worcester porcelain, Meissen and Sevres. We are dedicated to meeting the requirements of collectors from Adelaide to Zurich. Our company is VAT registered in the United Kingdom and audited. The item "Mdina Maltese Blue Glass Vase c1975" is in sale since Friday, October 13, 2017. This item is in the category "Pottery, Porcelain & Glass\Glass\Art Glass\Maltese". The seller is "scottishantiques" and is located in Bathgate. This item can be shipped worldwide.